Take a halved slice of salami and spread a layer of cream cheese over one side. 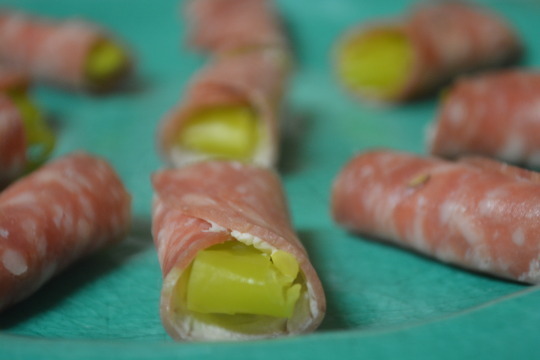 Lay a slice or two of pepperoncini on the cream cheese and tightly roll up the salami. Insert a toothpick into the middle of each one you make if you don’t want to eat these directly with your hands (the salami can get a little greasy). You can enjoy eating them right away but we like letting them chill before digging in. This might sound like a weird combination but it is really delicious ! It’s a great snack to have at any party, not just on New Year’s Eve !